I can't say enough about how fortunate we are in Port Elizabeth to have fantastic open spaces and rural areas right on our doorstep yet still within the Nelson Mandela Bay metropolitan area. 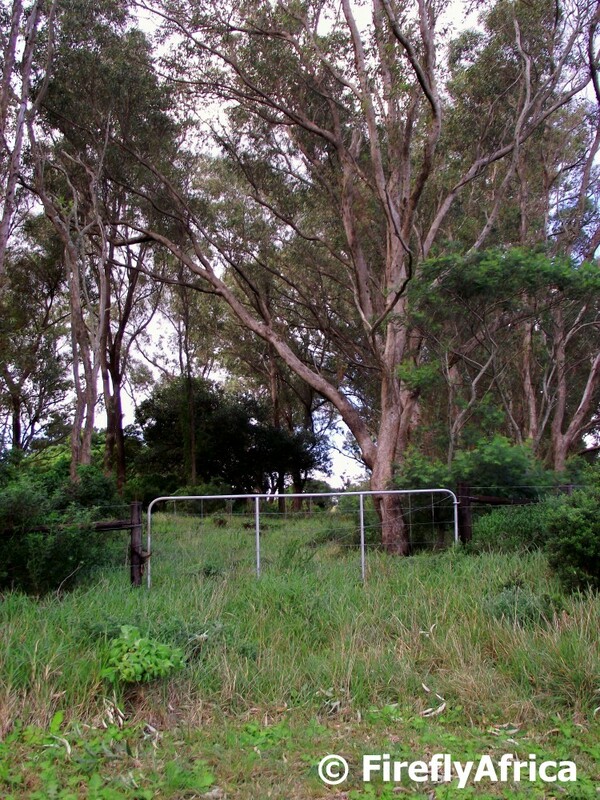 One minute you can be driving through suburbia and the next you are surrounded by small holdings and farms so its nothing strange to find farm gates like this one right outside the city. This particular one I photographed in Coleen Glen. Its weekend, and a busy one at that. The Kirkwood Wildsfees is on in the Sundays River Valley and the National Arts Festival has kicked off in Grahamstown so I don't want to hear any complaints. 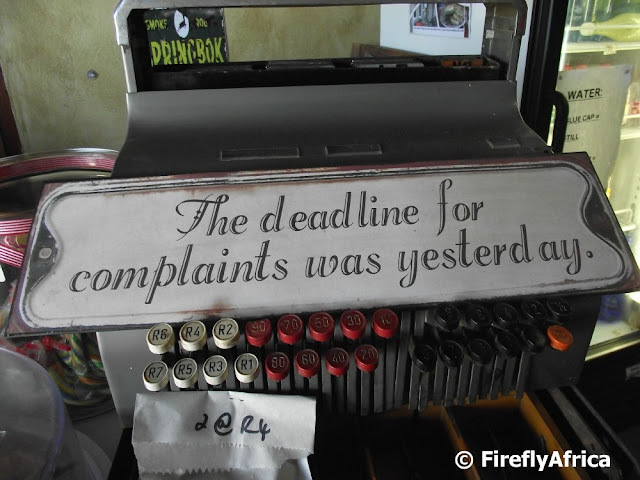 Like this sign I spotted in the Padlangs Farm Stall outside Patensie says, "The deadline for complaints was yesterday." Egyptian Geese are generally very territorial so once a pair finds a home they will very much stick around. This means that young birds have to find their own "unused water holes" which isn't always that freely available. I know of some that even made a dogless backyard with a swimming pool their home. It was great to see that a pair of Egyptian Geese quickly made their move in at the lake at the new Kings Beach development. Always great to see wildlife in urban areas. 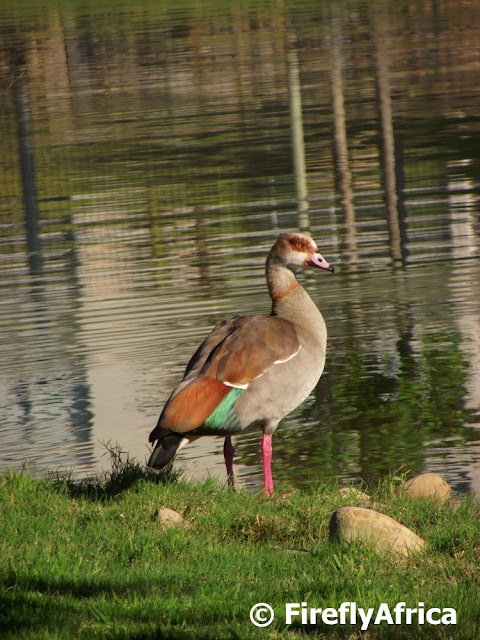 The Egyptian Goose (Alopochen aegyptiacus) is a member of the duck, goose, and swan family Anatidae. It is native to Africa south of the Sahara and the Nile Valley. Egyptian Geese were considered sacred by the ancient Egyptians, and appeared in much of their artwork. They have been raised for food and extensively bred in parts of Africa since they were domesticated by the ancient Egyptians. 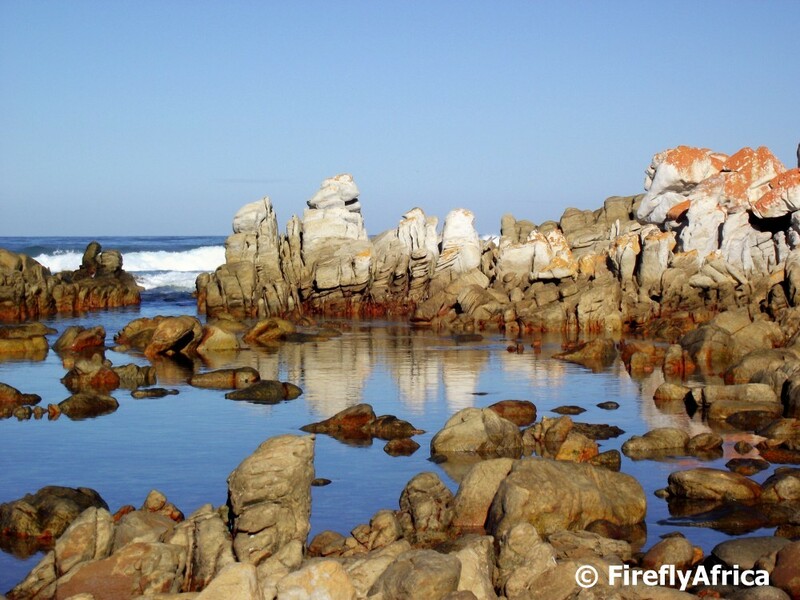 Kids love playing in rock pools and Port Elizabeth is fortunate to have many of those. The coastline from Cape Recife heading west may be called the Wildside because of its rugged coastline and rough seas when the wind blows, but its those same rocks that cause this piece of coast to be rock pool heaven. 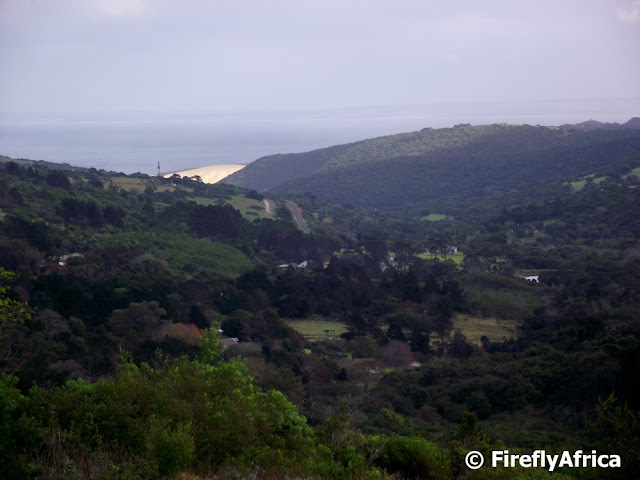 I ventured into Colleen Glen west of Port Elizabeth the other day in search of a geocache and ended up at the top of a narrow little road with the most beautiful view down towards the sea. 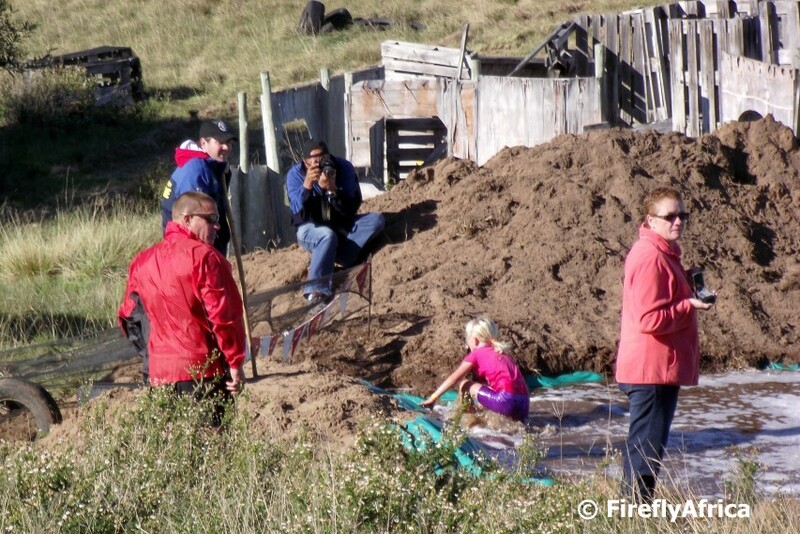 The Maitland sand dune can be seen in the background with farmland and small holdings in between. Pity it wasn't a bright sunny day. 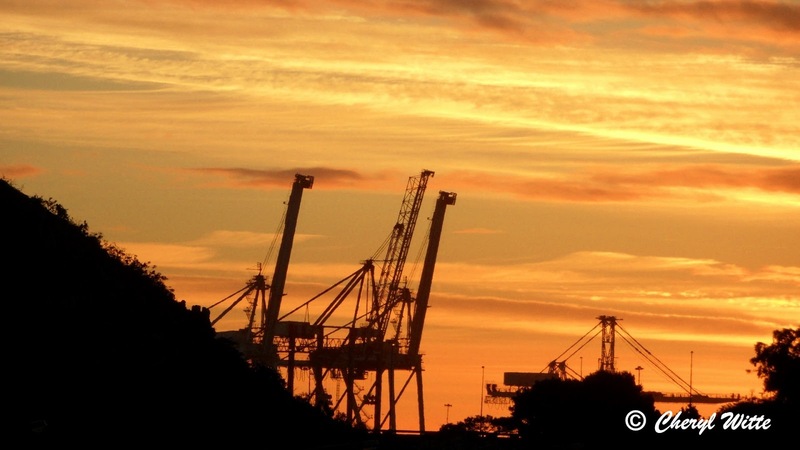 Port Elizabeth is usually associated with elephants due to its close proximity to the Addo Elephant National Park. Most visitors to the city, both local and international, spend at least a day in the park with others staying over at some of the park's variety accommodation options. Its easy to get to Addo from Port Elizabeth and its possible to sit and watch elephants less than an hour after leaving home or your hotel. The park can be accessed via the main gate and rest camp on the R335 in the Sundays River Valley or the south gate in Colchester which is only 30 minutes from the city. 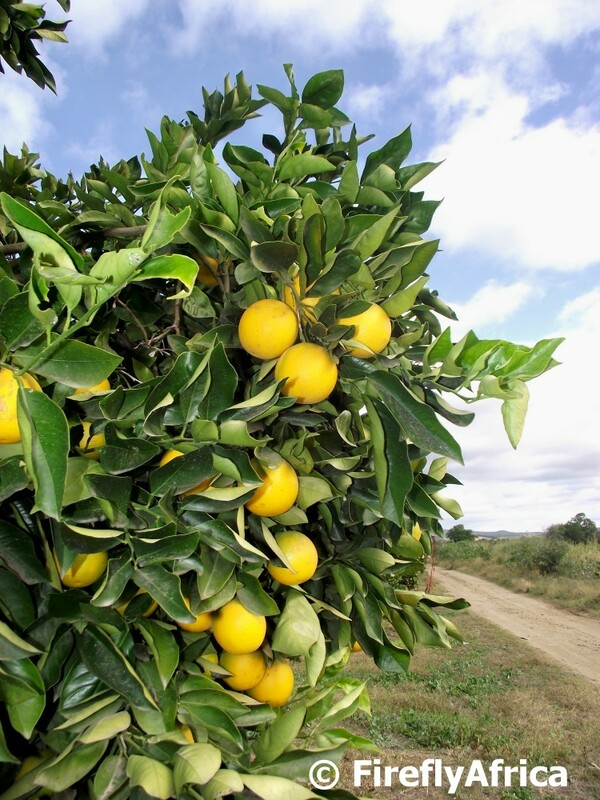 The Eastern Cape is South Africa’s second-largest producer of citrus fruit. Oranges make up the vast majority (80%) of citrus products, but the province is also well regarded for its production of ‘easy-peelers’ such as clementine and Satsuma tangerines, as well as navel oranges. Lemons, grape fruit and naartjies make up the balance of the harvest. Port Elizabeth has two major citrus producing areas right on our doorstep, the Gamtoos Valley to the west and the Sundays River Valley to the north. 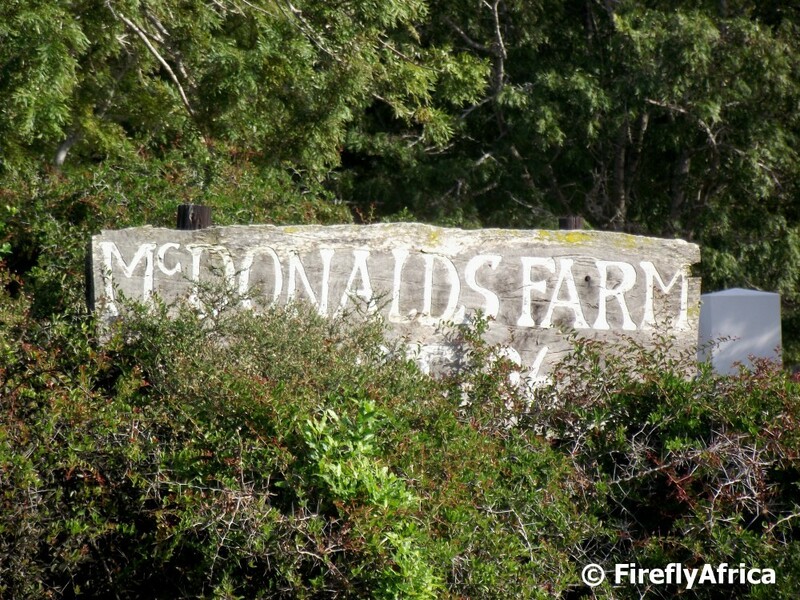 Have you ever wondered where Old McDonald's farm really is? 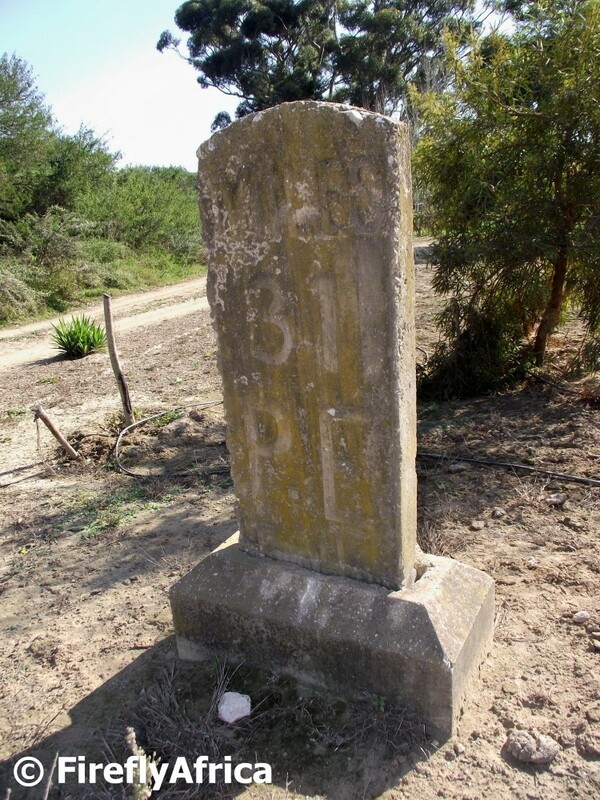 Well I found it right here in Port Elizabeth on the Old Seaview Road. Travelling along the N2 towards the Garden Route from Port Elizabeth, most people cross over the Van Stadens River Bridge in seconds as they hurry along. I often wonder how many of those have ever taken the time to take a leisurely drive along the pass on the old road. At the bottom of the pass one can pull over and enjoy the view, both up towards the bridge as well as down the gorge. It felt like such a peaceful spot with the river flowing in between the boulders that it felt a pity when we had to leave again. Whenever you see pictures of Fort Frederick its usually of the view towards the harbour, the entrance or the interior of the fort. I dug up a photograph which I took standing inside the fort while looking towards the Donkin Reserve. The top of the lighthouse as well as the giant South African is visible. Part of the Prince Alfred Guard Drill Hall can also be seen just below the lighthouse. Fort Frederick was built in 1799 by the British to defend Algoa Bay from invasion and became the first permanent structure built by the British in Africa south of the equator. It's that time of the year when the aloes are in full bloom and they can be seen both around the city as well as in the surrounding countryside. It doesn't matter if you're driving west, north or east (not south cause then you'll drive into the sea), the countryside is awash with the mostly reds and oranges as well as the occasional yellow of the different species of aloe in flower. 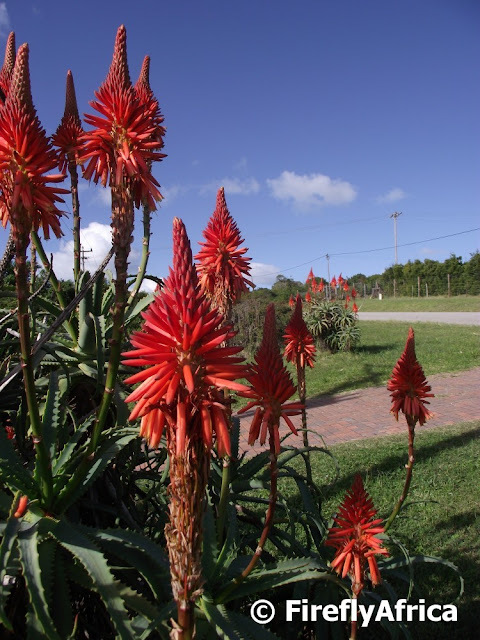 The aloe (I think its called fence aloe) in the picture was snapped on the Old Seaview Road. 31 miles from Port Elizabeth just off the Addo road (R335) is Addo Drift. 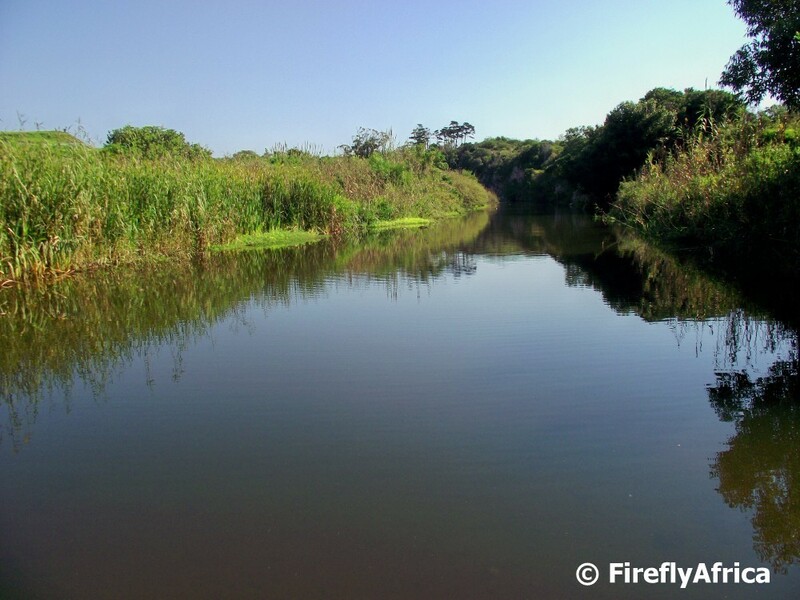 The drift was the first convenient natural crossing point on the Sundays River when travelling inland from the sea, and was used by wild animals and earlier human inhabitants as a ford. When the Europeans arrived, they followed the same route, outspaning their oxen at a point nearby. The military post “Ados Drift” appears on the site maps dated 1815. In 1823 one William Wright, an 1820 settler, was given a grant of land near the drift. The earliest record of a license being issued to Zondagh’s River Inn, is the Cape Almanac of 1830. 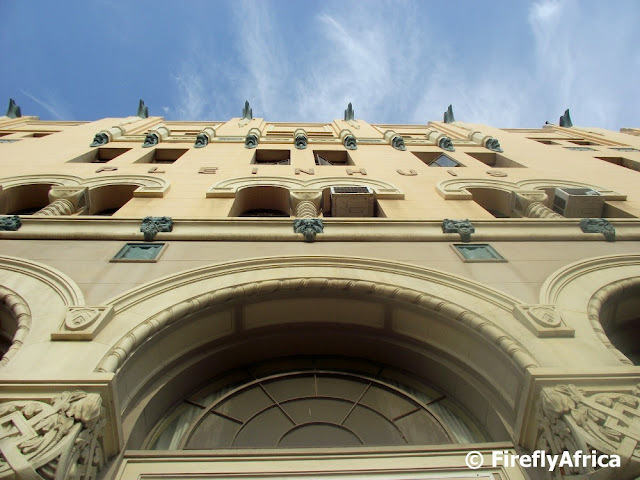 Port Elizabeth has some beautiful Art Deco buildings, some in good condition and others in need of repair. Pleinhuis (plein meaning square as in open space and huis means house) on Market Square is one of the prime examples in the city. I went to a meeting at Pleinhuis and before I entered looked up at the gargoyles on the side of the building. It just screamed out to be photographed, so I did. The new Kings Beach redevelopment has gone a long way to enhance the appearance of the Kings Beach beachfront and its great to see people going down there to use the area. 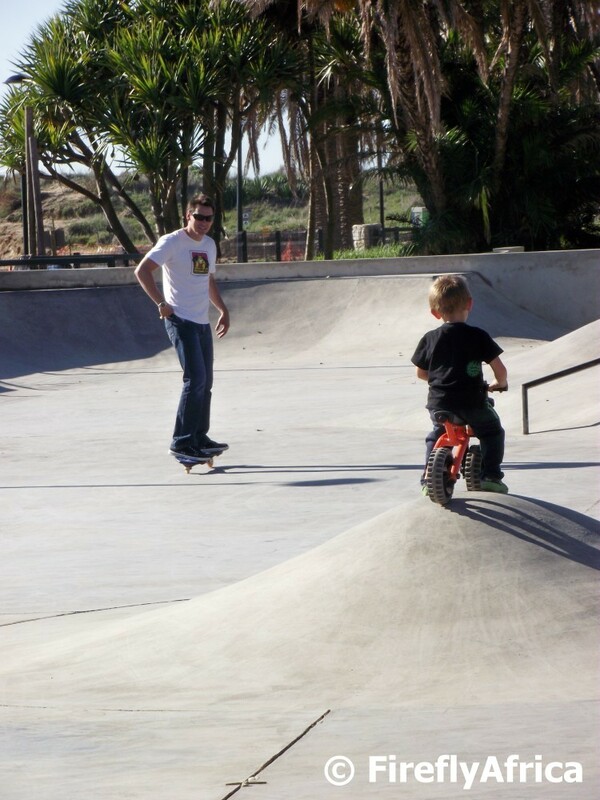 The development includes a small lake, new kids playing areas and a skate park. I took the opportunity the stunning early winter weather we're having offered to head down there for a walk and the windless day meant that the beachfront buildings reflected beautifully in the lake. I had a Sunday lunch of note today and I am seriously stuffed. What's the special occasion? Its Fathers Day of cause and I got thoroughly spoiled today. I was looking for a father themed picture to post and decided on this one I snapped at the new Kings Beach skate park the other day of a father and his son enjoying a nice warm day to try out the new facilities. Addo is a funny place in a backside kinda way. 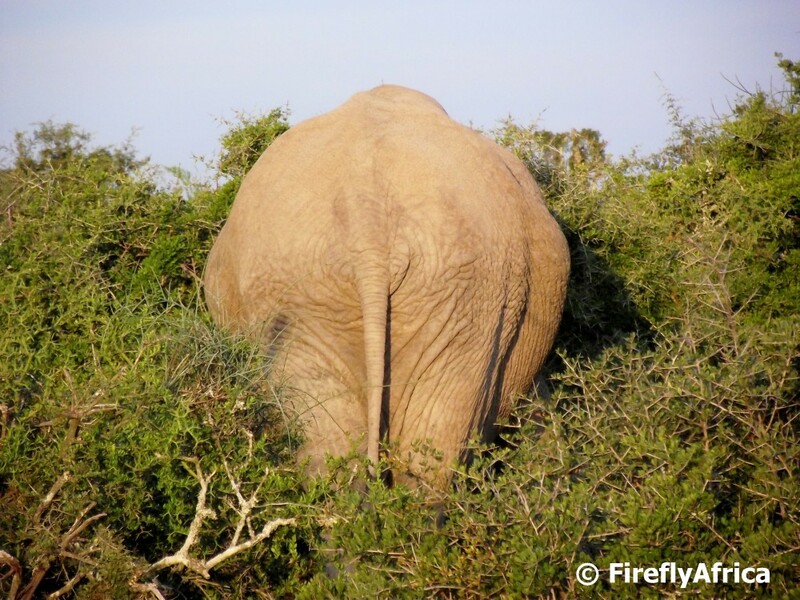 Unless the elephants are actually heading in your direction, the chances are good that as soon as you have lined up your shot that the animal will turn his back and all you get is a booty shot. Bummer! Its another beautiful sunshine winters day in Port Elizabeth and to celebrate that and the coming long weekend, here is Shark Rock Pier at Hobie Beach with the early morning sunshine reflecting off the ocean. 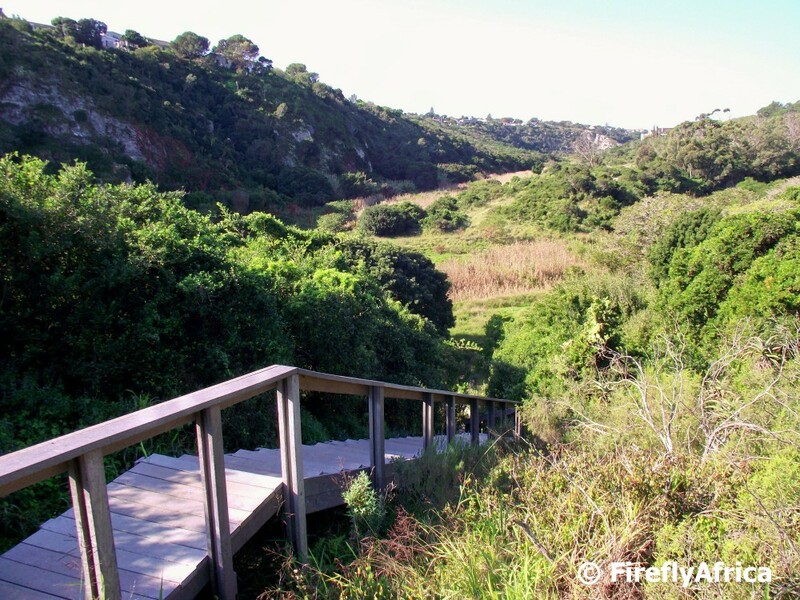 I often wonder how many people realise how many beautiful open spaces Port Elizabeth has. 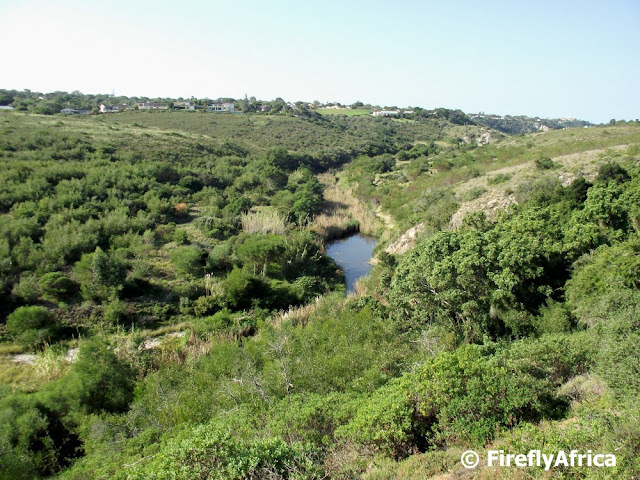 Some of them are natural open spaces like the Baakens Valley which includes Dodds Farm and Settlers Park, Cape Recife Nature Reserve, Sardinia Bay Nature Reserve and Maitland Nature Reserve. 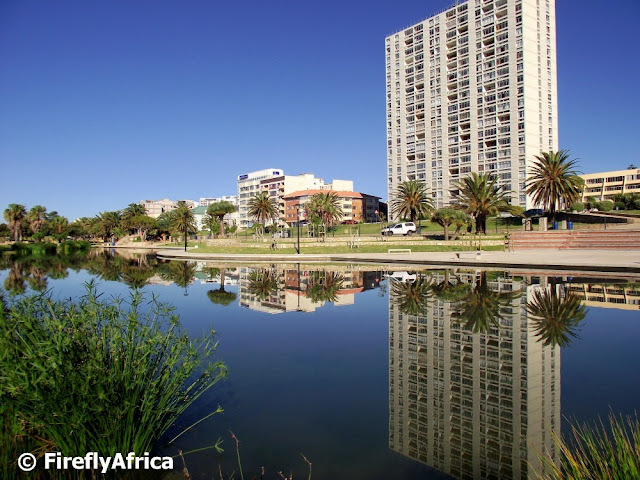 More formal open spaces like St Georges Park, Victoria Park and the Kings Beach lake area gives one a place to go for a walk where you are surrounded by paved paths and gardens. 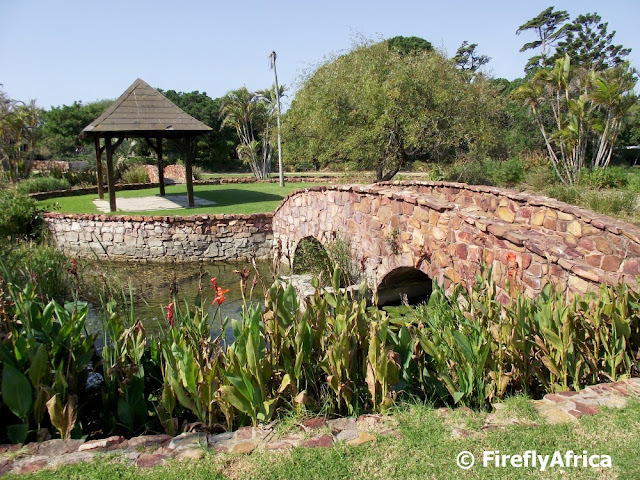 This spot with the stone bridge and gazebo is in Victoria Park just up the road from my office. 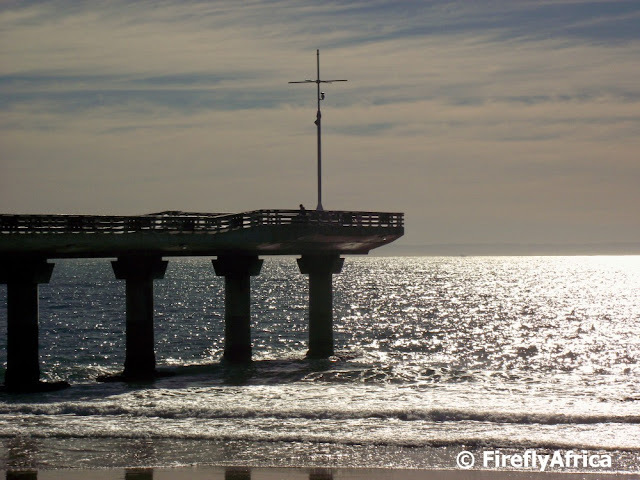 Winter has set in and the mornings and evenings are nice and cold, but we're lucky here in Port Elizabeth in that we have a very Mediterranean climate which makes our days quite mild. That is when there isn't a coldfront passing over. 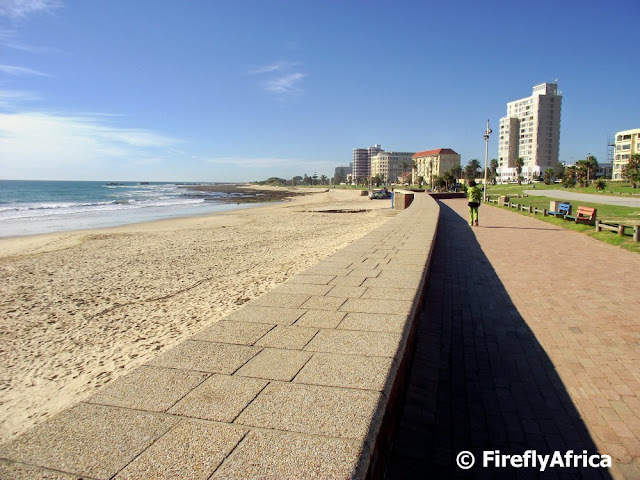 Winters means that the beaches are empty but people are still using the beachfront to walk, jog or just enjoy the outdoors. I've been on a horse only twice before. Once when I was in matric and again about 10 years ago. So I jumped at the opportunity when I was invited for a ride by the friendly ladies at Heavenly Stables on Sardinia Bay Road. 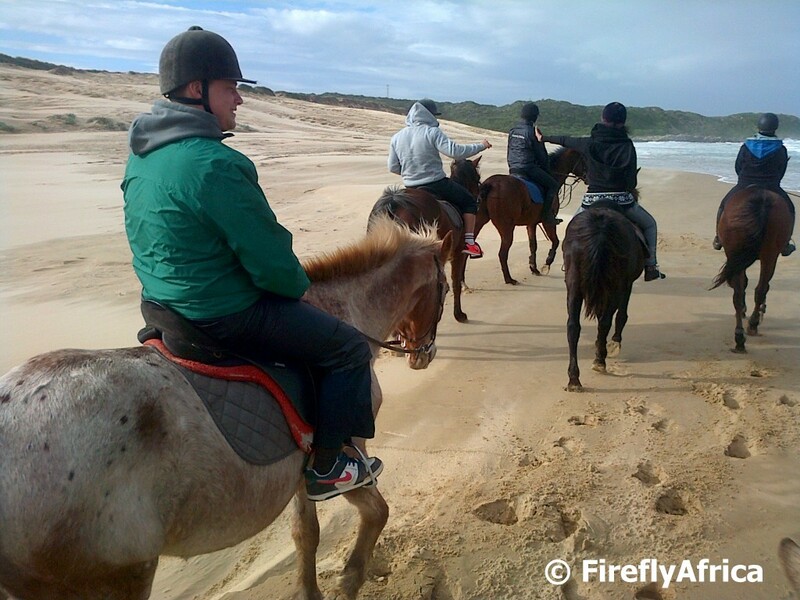 Although there are many stables in the Sardinia Bay area, I don't think many people know that the public can go for rides here as well. Heavenly Stables offer an 1 hour as well as a two and a half hour ride. The latter was the one we went on and the trail took us through the Sardinia Bay Nature Reserve through coastal bush down to the beautiful Sardinia Bay beach. I have to say I was expecting my backside to be sore the next day, but it turned out it was my knees (is middle age setting in?) and calves hurting from banging against the horse. *Phew* Thank goodness. It was an wonderful experience to go on the ride though and I will go any time again. Practise does make perfect. Not being an accomplished rider I decided not to take my camera along, but did snap a couple of pictures with my Blackberry. Disclosure: I went on the horse ride as a guest of Heavenly Stables and received no additional remuneration to write this post. All views expressed are my own. 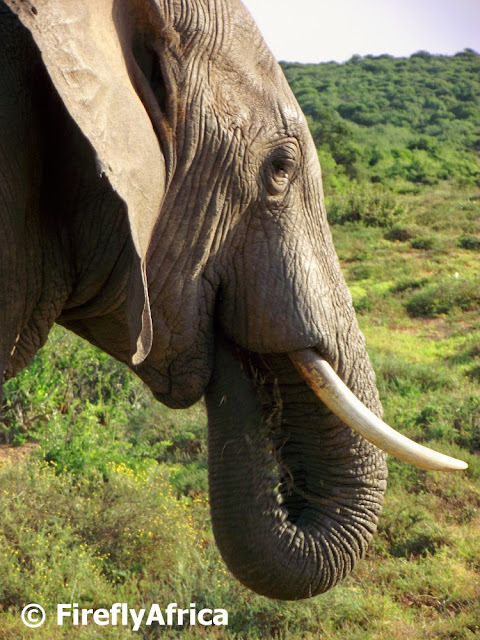 Addo Elephant National Park really is one of the best places anywhere in the world where one can see wild African Elephants fairly close up from your own car. 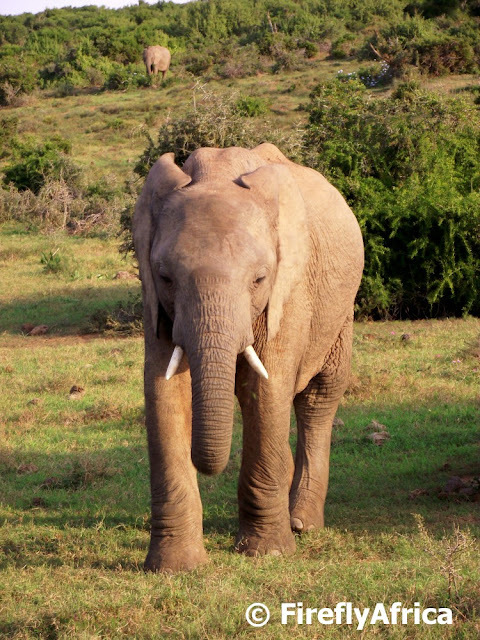 Here is a couple of elephant facts for today. I've posted a couple of Dodds Farm photos lately and have a couple more to come, but somebody asked in a comment how to get to Dodds Farm. So to accompany today's picture looking down at Dodds Farm from the top of the steps on the Lower Guinea Fowl Trail are the directions to get there. Its quite straightforward really. Driving from the beachfront side one has to get to Main Road Walmer via Walmer Boulevard which becomes Heugh Road. Turn right into Sixth Avenue (Walmer) and then left into Main Road. Travel along Main Road and turn right into 9th Avenue. Follow the road to its end and turn down to the right to get to the parking area. From here you exit the parking area on the right and follow the path over the weir and to Dodds Farm. There are several paths around there with picnic spots under the trees. The Lower Guinea Fowl Trail runs through the area from the 3rd Avenue Dip side towards Settlers Park. 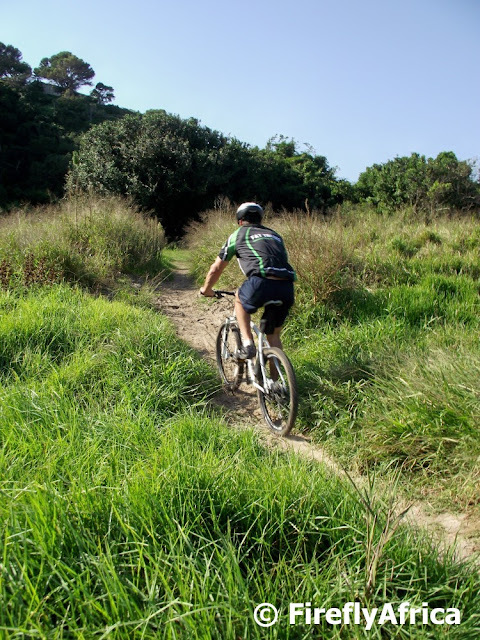 Mountain biking seems to be getting more and more popular alongside trail running. 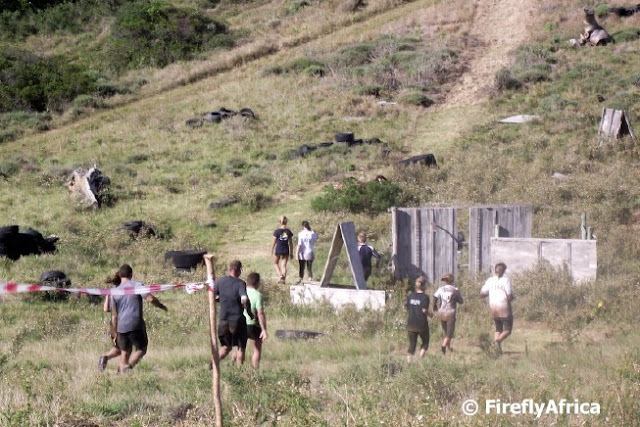 This means that more people are also starting to get out there and back to nature, returning to places like the Baakens Valley where there are some awesome trails for both running and cycling. This guy was one of three cycling together on the trails through Dodds Farm. Most people associate the Baakens River only with the 3rd Avenue Dip and the narrow canal the flows into the harbour along Valley Road and don't always think what it looks like in-between. During its meandering flow along the Baakens Valley it passes through Dodds Farm and Settlers Park, amongst others. This section is just above a weir at Dodds Farm and forms a nice little dam which is ideal to attract birds. 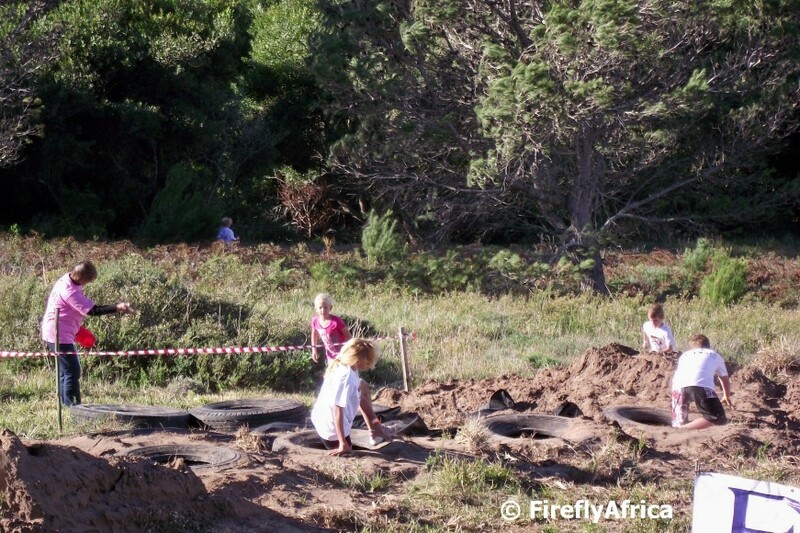 The guides doing the open vehicle guided game drives in the Addo Elephant National Park are vast treasure chests of information. I can't find the note I made of our ranger's name (Vincent van Zyl left a comment pointing out that the ranger's name is Ryan), but my mouth hung open as he rattled off plant names, animal information, pointing out birds and just chatted away with the guests on the vehicle. 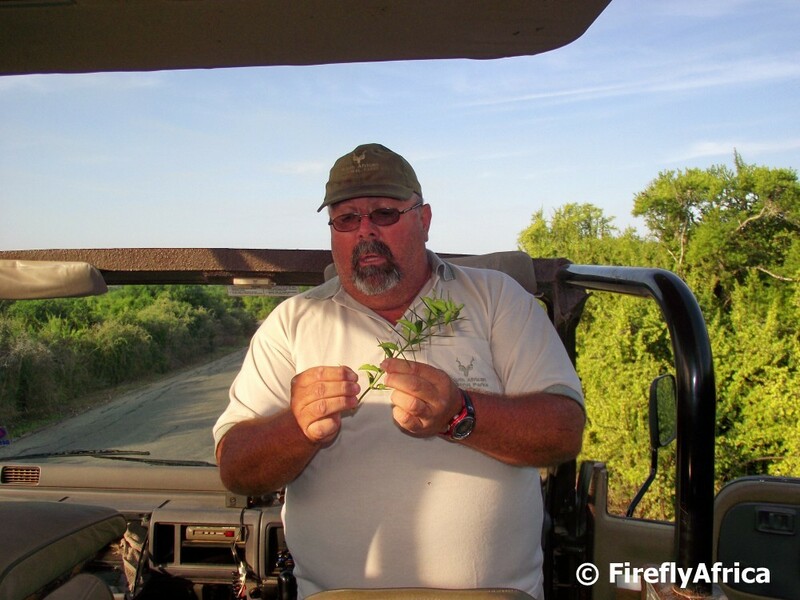 Guides and rangers like these are what makes visits to game reserves extra special. The first thing I noticed on my timeline when I opened Facebook this morning was a picture by my friend Cheryl Witte along with her daily Gratitude Journal. I don't often feature other people's pictures on PEDP, but I immediately called her to ask if I could. She took the picture on her way to work looking towards the harbour from Upper Valley Road just before the sunrise. Pictures like this is exactly why one should always carry your camera with you. Good one Cheryl. The Baakens Valley is crawling deeper and deeper into my heart. I really wish more people realised what an amazing place we have running right through the city. 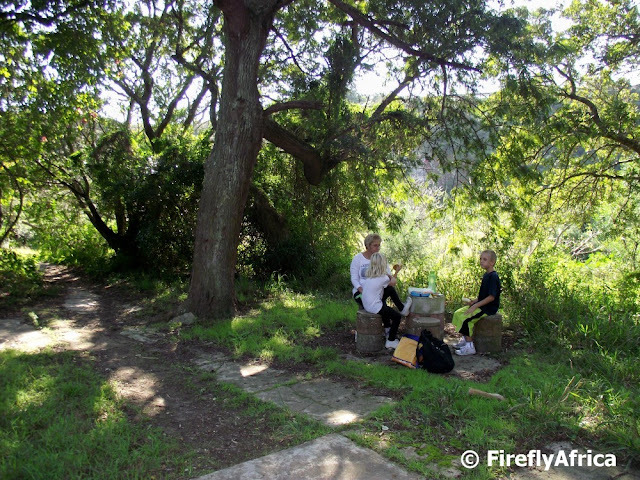 The Damselfly packed a picnic basket the other day and we headed into the Baakens Valley for a spot of geocaching, ending up at Dodds Farm with a picnic under the trees. There were a couple of other people having a picnic and painting while a number of joggers and mountain bikers passed us on the trails. 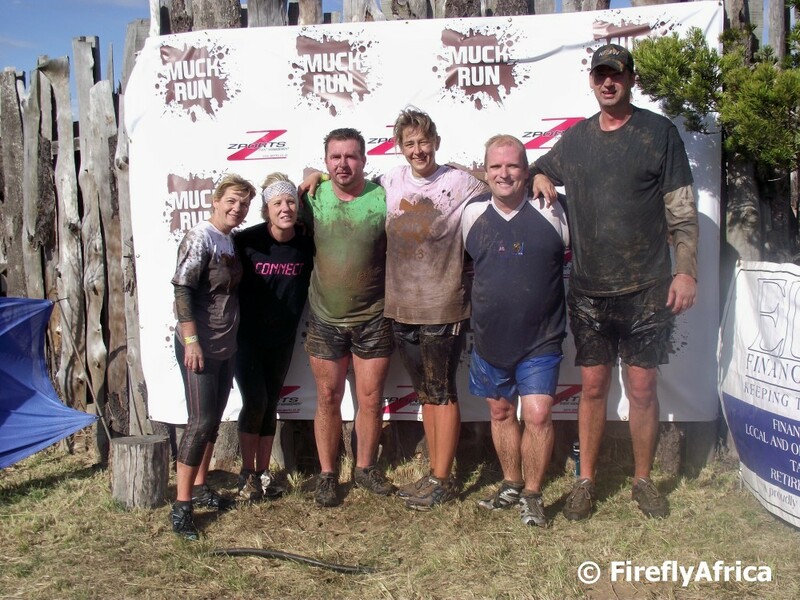 The AFTER photo. Yes, yes, I know I need to loose some weight and get into shape, but I'm working on it. 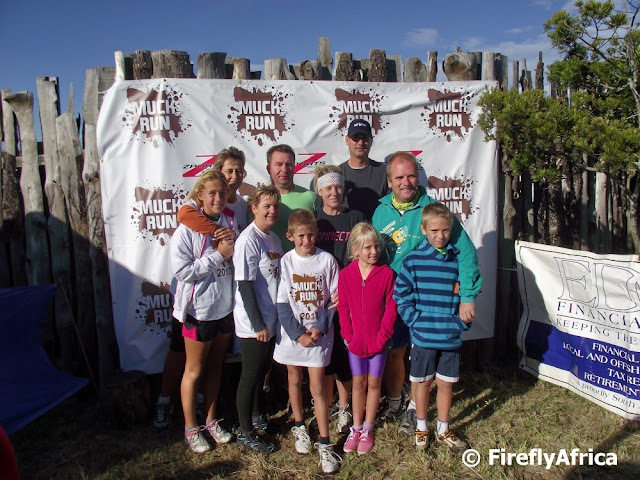 Our next team challenge... Urban Run in September. Just one post event note. Usually after races like this you get a medal that ends up in a drawer or box somewhere. Some even go straight into the bin. Zports went a different route with Muck Run and rather than medals gave every finisher a Muck Run bandanna instead. Very good idea. 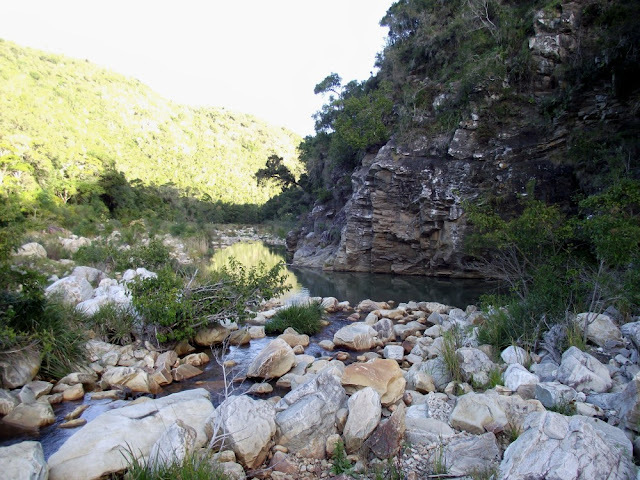 I explored a bit of the Baakens Valley along Lower Guinea Fowl Trail on a geocaching outing with the family and as always my camera went along for the walk. This spot is looking east towards Dodds Farm and down at the Baakens Valley from the mountain bike trail.